What’s The Best Way To Store Large Plan Drawing Documents? If you work in industries like architectural design, engineering, landscaping, construction, or drafting, you need a convenient and efficient method in place for storing those over-sized blueprints, and other large design documents? Storing plan drawings flat takes up a lot of space and there’s probably no available work surface big enough to allow you to stack all these drawings flat in your office. Besides, leaving plans lying on a table pretty much guarantees somebody’s going to spill coffee on them. If plan drawing storage is a problem for you, then keep reading because we have the perfect large document storage solution for you. 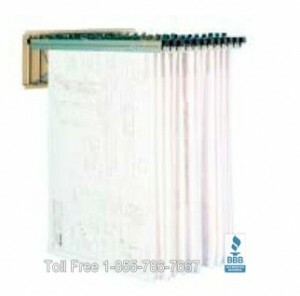 Many companies store large plan drawing documents rolled up. Rolling plans up for storage is actually pretty efficient as far as space management goes. Cardboard tubes can be used to provide added protection so the prints don’t get torn or crushed. However, trying to get the paper to lie flat after it’s been rolled up is frustrating. You have to tack down the corners or find some paper weights to keep it lying flat on the work table. Fortunately, there is an easy way to store all your active plan documents. It’s all about going vertical to save space and ease access to stored drawings. Plan drawing wall racks and plan drawing shelving are convenient and efficient options to storing plan drawings in your office. 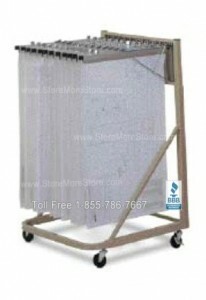 There are also hanging plan drawing stands that have casters so you can easily roll a rack of plans from one room to another. Just clamp the drawings in place and let gravity do the work of keeping your documents nice and flat. 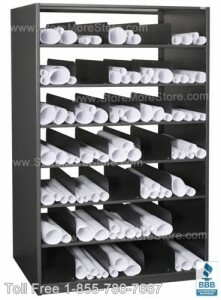 Individual hanger arms allow you to easily sort through and find the plan you need at a moment’s notice. These are a few suggestions on how best to store your large plan drawings, blueprints, or other large documents. 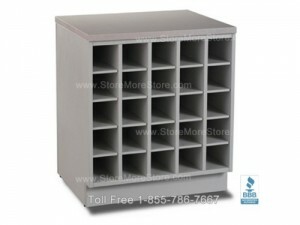 You will need to choose your large document storage solution based upon on your current and future needs. Whether you need flat plan drawing storage, rolled document storage, or hanging large document storage, we’ve got it all at StoreMoreStore!